In 1952, Schuco Toys of Nuremburg, Germany released a tin toy motorcycle powered by a wind-up clock spring that was known as Charly 1005. 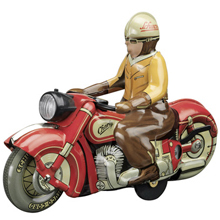 Fifty-eight years later, Schuco is re-releasing this classic tin motorcycle in a limited batch of 2000 pieces. Schuco gained fame throughout the 1930s when the company began producing scale cars made out of tin that were powered by a clock spring. 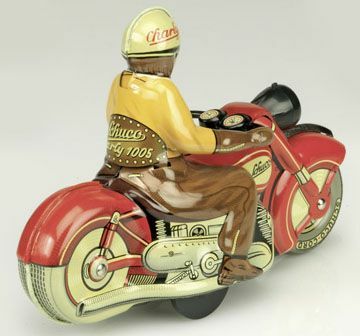 After the Second World War, Schuco began producing their famous tin toys once again, which included the Curvo 1000, a tin motorcycle that was able to ride in circles and even elongated ovals. In 1952, the toy company from Nuremburg began producing a model that was essentially the same as the Curvo 1000; except that the motorcycle was painted red with the side of the tank and the rider’s kidney belt having the name “Charly” painted on, thus giving the model its name. The toy itself is not very large, measuring just 5.5 inches in length and is roughly 4 inches tall to the top of the rider’s helmet. The toy bike resembles contemporary German makes of the day such as Horex or NSU with a painted on vertical engine and other details. The front wheel and tire are of tin construction, and are painted with spokes and tread to resemble the actual full scale component. The rear wheel and tire are again painted, however it is cast into place with the rear fender of the bike; the reason being that there are two wheels located under the rider which keep the painted rear wheel assembly just off the ground, as these two wheels provide the power and balance for the scale machine once in motion. To the left of the stationary rear wheel is a short lever. To the rear of the lever, painted on the rear fender of the toy motorcycle is the word “stop”. Above the “stop” position is a circle, and above that is painted an oval. Just ahead of the lever is a cut out to insert the key to wind-up the clock spring. Placing the lever in the “stop” position and winding the spring allows the toy to be placed securely on the surface prior to being released. Charly immediately goes into action once one of the positions above the word “stop” is selected. What’s so unique about Schuco’s toy is how it is able to lean into the turns like a full-scale motorcycle. This is accomplished by the two wheels under the rider. The large wheel on the right puts the power to the ground and the smaller wheel on the opposite side of the axle assists in keeping Charly stable through those high bank angle left turns. The little tin motorcycle is capable of riding a continuous circle if the lever is bumped up to the first position above “stop”. Charly simply leans in and takes off in a circle for a minute or two when released in this position. Moving the lever two clicks up to the oval position is where Charly really shines. The little bike takes off in a straight line and then leans to the left for 180 degrees, before taking off in a straight line again with the rider returning to a centered position, continuing in an oval pattern. Again, Charly is happy to perform this routine for a minute or two before needing to be re-wound. At a retail price of $99.00, and with just 2000 pieces being made available world wide, Charly is bound to be a success with vintage toy collectors across the globe. Charly is a product of Schuco’s factory in China, and it must be said that the quality is very, very good in regards to this being a 21st century re-issue of a German classic. The packaging is very nostalgic in that the box is painted just as it would appear to have been in 1952, and a direction sheet is given in German, as well as a certificate of authenticity. In the end, Charly will make a great addition to any vintage toy or automobilia collection. If you are interested in Schuco’s Charly 1005, pick up the phone and call Sunrich Toy and Hobby direct at 909-287-0655. Mention that you saw the product on Sports Car Digest, and the team at Sunrich Toy and Hobby will take 10% off your order. For additional information, visit www.sunrichtoy.com. The rear wheel and tire are again painted, however it is cast in to place with the rear fender of the bike.